As we reported earlier this week, Neil Young’s Decade album -- long out of print -- will be re-released on Record Store Day, April 22. 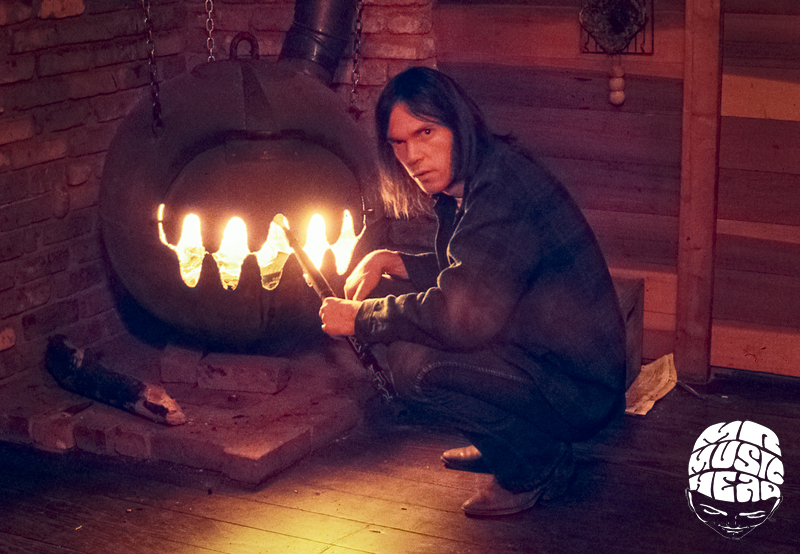 As evidenced by the comments here on Thrasher's Wheat, Neil Young’s Decade album is much beloved by longtime fans and -- for many -- served as the gateway album to Neil's musical catalog. Now what about that cover image? Designed by Tom Wilkes, he served as the art director, album cover designer, and photographer for the Decade album, as well as, other Neil Young albums such as “Harvest”. And who is in the image on the cover behind the guitar case? The long time story has been that it was Neil's girlfriend Carrie Snodgrass out in the desert. However, upon closer look below, it does not appear to be Carrie at all. 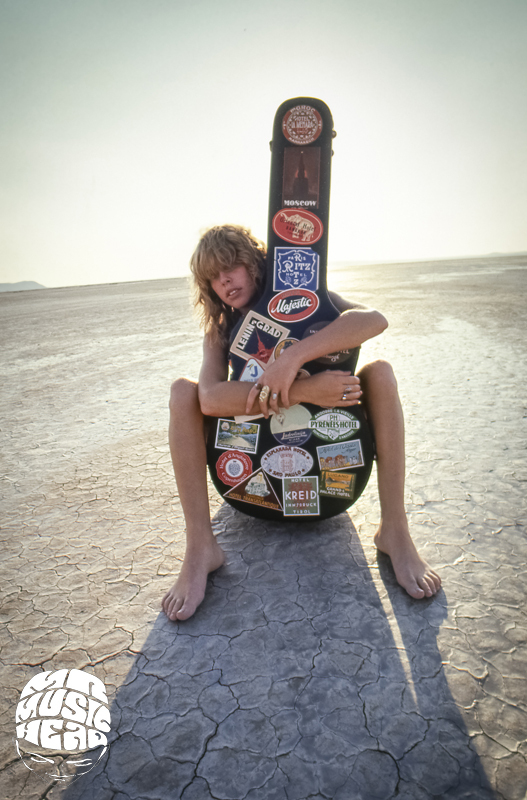 Upon doing a little more research, from "Shakey" by Jimmy McDonough: "The packaging was great - wry notes on each song handwritten by Young himself, and a cover photo obscure even by Young's standards - the girlfriend of art director Tom Wilkes standing out in the desert, balancing a well-traveled guitar case on her back." Tom Wilkes was an art director, album cover designer, and photographer who blazed a graphic trail throughout the 60s, 70s and 80s, creating high concept visual statements that have become iconic cultural artifacts. A graduate of Art Center, he got his start pinstriping hot rods and motorcycles in the 50s before opening his own design studio in Long Beach and moving into record company work with an album for The Coasters. 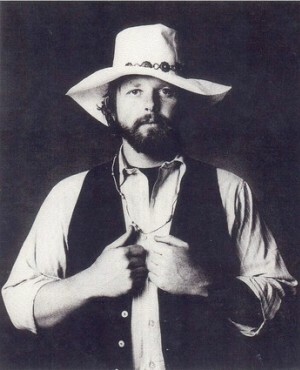 His covers include “Flowers” and “Beggars’ Banquet” for the Stones, the stairwell albums for the Beatles, “All Things Must Pass” and “Living In The Material World” for George Harrison, “Harvest” and “Decade” for Neil Young, the whiteface album for Ike & Tina Turner, and many, many more. In 1967, as art director for the Monterey Pop Festival, Tom was given a painting by The Beatles, a work that has since become known as “The Dead Sea Scroll Of Rock And Roll.” In the late-70s, he became friends with John and Toni Lilly who introduced him to the concept of dolphin intelligence. After several profound encounters, Tom created Project Interspeak and spent the rest of his life trying to mount a global concert on behalf of the dolphin nation…with the Beatles’ artwork a possible funding source. He lived a highly adventurous life filled with wild times and beautiful women, and is celebrated in the memory of those who knew him as one of the great rebellious spirits, and artists, of his time. "He was able to capture a certain essence of what was on the record and the person who made it. "You look at something like Neil Young's 'Harvest,' the texture of the cover and that very simple, almost antique lettering, and you get a feel of what Neil was trying to do in that record, the honesty and the grit and the deep Americana of what that record represents now." R.I.P. Tom. We've always admired your work. Yes great album/artwork,at the time a comprehensive introduction to Neil's back catalogue. If you hadn't heard any of his back catalogue,Decade vinyl for the sleeve, was and still is a great starting point. I'd rather own this than the bold archive box. "Standing"???? 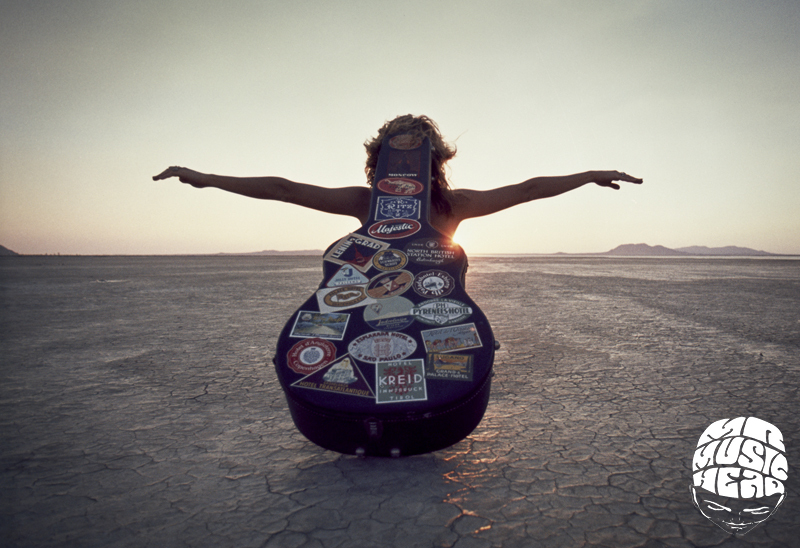 ..."standing out in the desert, balancing a well-traveled guitar case on her back"??? I could tell that she was sitting in the desert even as a little kid looking at the cover in my cool teenage cousin Laura's bedroom. Sure is nice to see the other picture where she turned around and faced the camera! When I was a kid I had no idea who he was and assumed it was him with his guitar in the photo! And Alan, there is an Edinburgh sticker but it says North British Station Hotel. Some of them are hard to read even on the original cover though so maybe there is! The description of the Harvest cover as having almost antique lettering for title font is so true. And seeing it in an article about the Decade cover really made me aware of how opposite its font is! Back in the 70's that kind of typography was mind blowingly futuristicly modem. Couldn't be more opposite from Harvest. After the Goldrush was a whole other story, what was that all about??? I'd like someone who knows all about type and NY to write a whole site or blog or something about each album! The design of his latest album tells me he couldn't care less about covers or fonts anymore at all. Or am I missing something?